After the apostles Peter and John had healed the lame man at the Gate Beautiful, the two disciples were arrested and later brought before the Sanhedrin to account for their deed, one that continued to stir the already anxious leaders of the Jews: “And when they had set them in the midst, they asked, “By what power, or by what name, have ye done this?” (Acts 4:7). Indeed, what was the source of their miracle? And by what power or authority did they perform it? Those queries ring through the centuries because people in our day still pose the questions. Most Christians want to be a part of a denomination or organization that is true, faithful to what existed in the first century, authorized, and therefore approved of God. They want to know, in other words, that God is governing among his people, that he is empowering the body of Christ of which they are a part. 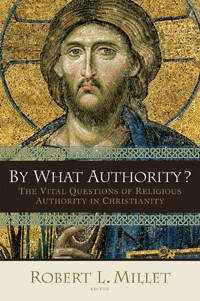 The essays in this book address the central issue of such authority in the Christian life. Contributors include Peter A. Huff, Richard John Neuhaus, Bradley Nassif, Stephen D. Ricks, Gerald R. McDermott, Robert M. Randolph, Robert L. Millet, Steven C. Harper, George R. Knight, David Neff, and Roger E. Olson.